Starting this Saturday, Muni will be restoring some service prior to the last round of service cuts that happened in early May of this year. 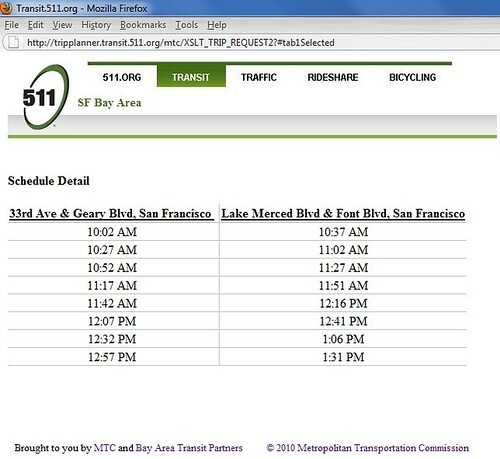 The SFMTA has published a paper version of the frequency schedule for the vehicles and there is also one posted online to view as well. Also, the better news is the restoration of metro service for the M-Ocean View and K-Ingleside lines beyond St. Francis Circle. This should be a big relief to those City College and SF State students who have suffered on the temporary bus substitutes. While Muni can celebrate the restoration of service, there is one big elephant in the room that has not been resolved, a new published time schedule (not frequency schedule). Not all passengers ride trunk lines that comes every several minutes; I depend on a time schedule for the 18-46th Avenue because it currently runs on 20-25 minute frequencies and I want to minimize waiting, especially on cold or wet days. Currently, Google Maps refuses to give passengers any transit directions help for dates on and after September 4th, and 511's Take Trip Planner is providing the old time schedules. This screen shot is from Google Maps. It is unable to give me data for my journey. This screen shot is from 511. It gave me 25 minute frequencies based on the schedule provided when Muni promised 20 minute frequencies for weekday mid-day service (starting 9/7/10). Here's an easier to read frequency schedule based on using 511's trip planner. There was a link on the previous screen shot that opened a window describing the time schedule. The times provided shows a 25 minute frequency while the agency is supposed to provide 20 minute service starting next week. This is the third time I caught Muni with their pants down. They did this stunt in December with their first round of service reductions and major re-routes, and again in May with their service cuts. 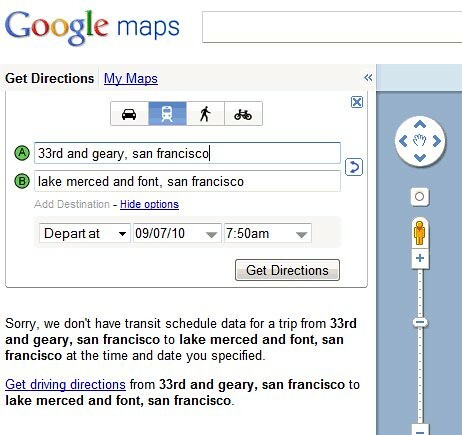 Both Google Maps and 511 was not prepared for the time schedule changes until just days before the changes were to take into effect. Hey Akit, are you going to report on the St. Francis Circle construction? Today (around 3:30ish), eastbound Sloat Blvd. was down to ONE LANE just to PAINT the roads. Not only should this construction NOT be taking place during peak school hours, but I couldn't find any information about today's closure on the SFMTA website. It's been ridiculous. If they want to get rail service back and running by Saturday morning, they'd have to do everything possible to handle that, even if it meant stopping traffic.